It’s time to look at an old school monster type film. I’m not talking creatures here, but a human monster. It plays out pretty much like you would expect and is essentially like the Electric Monster film. My biggest complaint is really just the fact that they waste Lon Chaney here since you can barely even tell that it’s him with all the makeup effects. They may as well have gotten just about anybody. Chaney is at his best when he’s talking so why give him a role where he can’t speak? The film starts off with Chasen narrating about how tough things were about to be. He’s a detective and as such he does a lot of monologue scenes. But lets not get ahead of ourselves. A criminal known as the Butcher has been caught at last and is about to die. Before he passes, one of his fellow crooks named Paul tries to get him to spill the beans about where the stolen money is. Butcher doesn’t reveal this, but he does say that he’ll come back from the dead to destroy Paul. Paul doesn’t believe the threats, but Butcher ends up coming back to life thanks to some electricity experiments from a pair of scientists. Now Butcher intends to murder Paul and two other crooks so that he can reclaim the money and his friend Eva. Well, he doesn’t know that they’re “just friends” Eva hasn’t told him that part yet. Chasen is put on the case to stop this guy, but what can he do against a bulletproof monster? If you’ve seen enough creature features you can probably call this one beat for beat. It doesn’t try to do anything outside the box or anything like that. It just gives you exactly what you’re expecting. That’s not necessarily a bad thing but there’s not much to make this a memorable experience either. You could substitute the Butcher for Frankenstein and it wouldn’t make a difference. Still, Butcher’s a reasonably fun villain. I just wish he could talk since he made for a much more interesting villain before he died. If anything he ends up getting out shined by Paul in the present. Paul’s a quick thinker and has some good plans. For example, punching one of the police officers was smart since they had to arrest him for that. Honestly I wouldn’t trust them to keep me safe from the Butcher, but it beats wandering the streets right? Thing is, Butcher isn’t particularly fast so whenever he catches someone it is only because that person tripped or boxed themselves in. He racks up an impressive body count so people tended to underestimate him. Even several cops were taken down which was a little surprising since usually the villain is taken down a little sooner than that. Trust me, you’ll be surprised at how many guys get bumped off by this character. I guess he earned the name. As for our lead Chasen, he’s not terrible but he could be better. He’s very overconfident and while he is a good detective, his confidence isn’t always warranted. He takes forever to solve cases and only manages to clear this one because Butcher isn’t exactly subtle. He’s also very presumptuous as he gets Eva fired from her job before even telling her about this. He just assumes that she would want to marry him over keeping her job so naturally that would mean that he made the right call right? It’s the kind of scene that certainly wouldn’t happen nowadays, but in retro films like this one the romance was always super direct like this. They met and the next day it was time to be married. Naturally you can tell that this is not a romance plot I could get behind. As for Eva, she didn’t seem like a great character. Everyone pushes her around and she may have been rather misleading with the Butcher. She actually left her envelope filled with possible riches in front of a super shady guy while she went off to do her performance. Keep in mind that the door is open so anyone could wander into her room at any time. As a result she doesn’t notice when the guy swiped her treasure map. She’s just not the smartest cookie around. Meanwhile the police chief was pretty fun. Naturally he is a little out of his depth, but the guy does have good plans and is pretty reasonable. Most chiefs would have just told Chasen no dice as soon as he started talking, but this guy did hear him out which is a considerable improvement. In general the writing was pretty solid here. I’d give the pacing a thumbs up as well. The movie may not have particularly excelled in any areas, but it didn’t really make any mistakes either. The film is consistent and that is always a good skill to have. 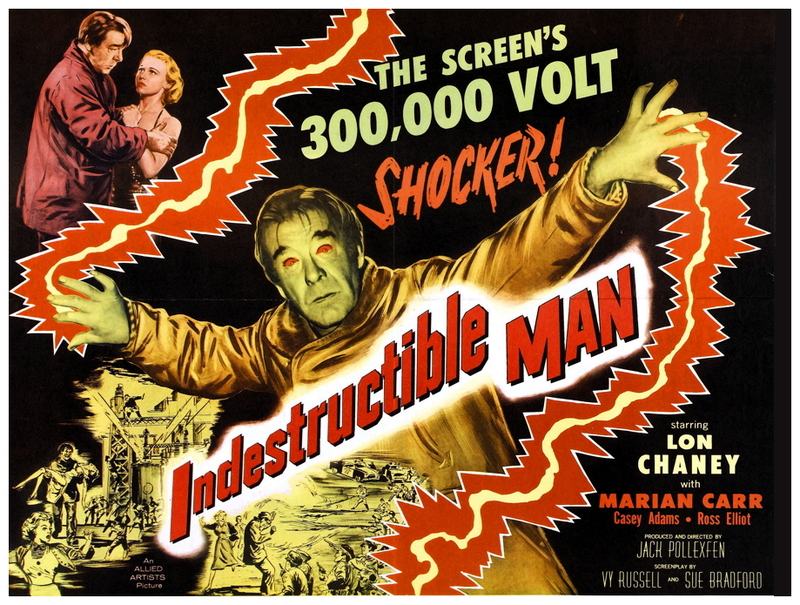 Overall, The Indestructible Man is a solid film. It’s a classic monster story even if it never does try to be anything more than that. My main negative would still be the fact that Butcher just doesn’t look enough like Chaney. Imagine how much more humorous the film could be if you had Chaney chasing everyone with his classic monotone voice. It would have likely elevated this film quite a bit. If you haven’t seen the movie yet then I’d recommend changing that. If you’ve already seen a bunch of other films in this genre then there isn’t much of a rush though. It’s not as if this is a film that anyone will ever bring up in day to day life so you likely won’t get exposed for missing it. This entry was posted in Live Action Movie Reviews, Live Action Movies, Reviews and tagged Action, Film Review, Movie Review, Review, The Indestructible Man, Thriller by dreager1. Bookmark the permalink.